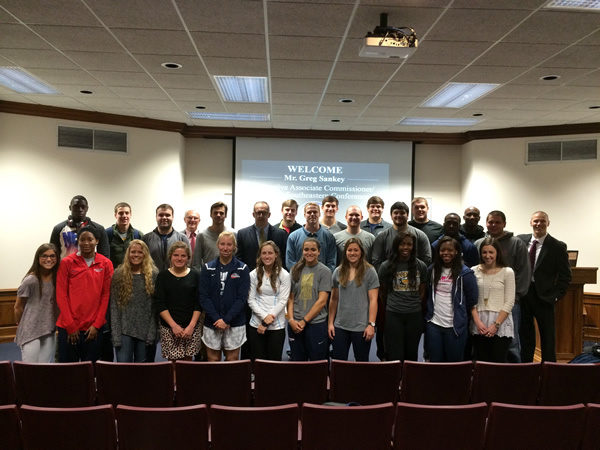 Samford University’s Department of Kinesiology hosted Greg Sankey, Executive Associate Commissioner for the Southeastern Conference, on campus February 9. Sankey, an accomplished collegiate sport administrator, spoke to Dr. Nathan Kirkpatrick’s Sport Governance and the NCAA class, sharing stories from his career and tips for personal and professional success during the question and answer session in Brock Forum. “Life is primarily about the decisions you make,” he said recalling his decision to stop simply working for the weekend. “It’s amazing the talent that’s wasted because of bad decisions,” he added. Sankey encouraged students to not be afraid of working hard, noting that although relationships are important, it’s not all about who you know. For him, the most important attributes of a prospective employees relate to their ability to do good work, to work hard, and to be someone who can work with the team. A member of the Church of Brook Hills, Sankey acknowledged that living his faith in the workplace can sometimes be difficult. “If you want the easy path, set your faith aside,” he said while urging students to be accountable for their actions now, and later as professionals. Sankey closed the session with a list of his favorite advice, including: money doesn’t lead, it follows; don’t be afraid to take a leap of faith; evaluate a job on whether or not you’ll be challenged and consider those who you will be working for and with; don’t limit yourself by geography; show up, listen and be ready to learn; always be prepared, and finally—realize you aren’t going to know everything and that’s okay. The Sport Governance and the NCAA class is part of Samford’s new Sport Administration major. To learn more about the program, visit www.samford.edu/kinesiology.